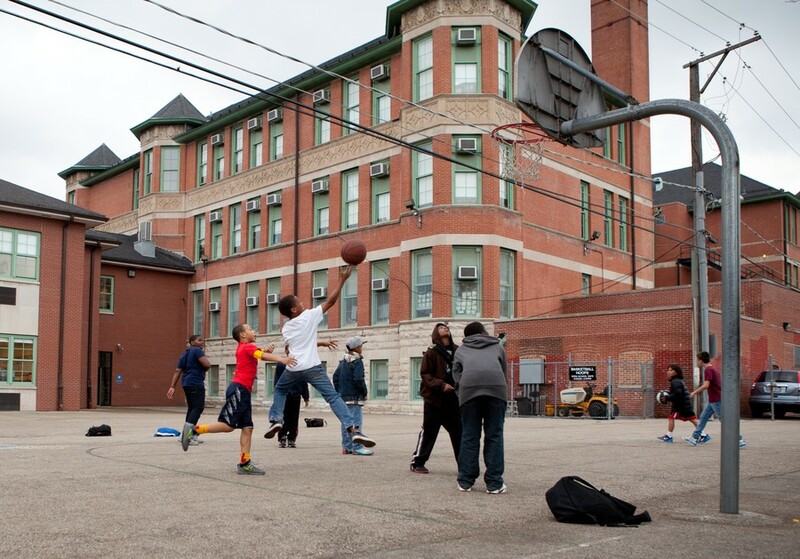 Students from Ray Elementary School play pick-up basketball after school. Due to Chicago Public School closings in the upcoming months, Ray will gain students from Canter Middle School. [media id="106759" align="left"/]As CPS contemplates its proposal to close 54 elementary and middle schools at the end of this year, students from one RSO are paying particularly close attention to which schools get cut. Overall, the closings have had a limited effect on University-run school programs, like the Neighborhood Schools Program and Women and Youth Supporting Each Other, as many Hyde Park schools that partner with the programs have not been selected to close. However, for the South Side Free Music Program, which provides music lessons to children ages five to 14, the proposed closing of three elementary schools near KLEO Community Family Life Center raised concerns about a potential decrease in program attendance. If these schools—Anthony Overton, Crispus Attucks, and Francis Parkman Elementaries—close, fourth-year Noah Huh, who oversees the program’s operations at KLEO’s Washington Park location, worries that students will no longer be able to travel there for music lessons. “Chances are parents are not going to take their kids [to KLEO] or would relocate to a different center. If the latter, it’d be ok, but we’re scared of the former,” Huh said. Huh said the closings will be the second major threat to program attendance the group has faced in the last year, recalling the concern the program had when CPS decided to lengthen the school day for the 2011–2012 school year. Because students were let out of school later, more of them chose to go directly home afterwards. “Attendance at KLEO dropped dramatically, and that discouraged our teachers from showing up,” Huh said. Though the program has had internal discussions to plan for the effects of the proposed closings, Huh and the KLEO administrators also worry for the welfare of the students. “Instead of going to the center, [they might choose] a lifestyle that’s not so favorable, especially a gang lifestyle,” he said. He expressed additional concerns that students would have to walk through gang lines to come to the center after being relocated to another, further school. The program also operates in Sexton Elementary School in West Woodlawn, which is slated to close as well. According to fourth-year Spencer Washburn, who works in Sexton, program members would have to build relationships with a new set of teachers and administrators if they hope to continue their work in the area. However, they may be able to continue working with the same students. “The principal [at Sexton] has indicated that she would like to advocate for the new administration to continue to work with us as an organization, but nothing has been finalized,” he said.